On Wednesday, I put out a Facebook post asking for unconditional love because it was the first day in as long as I could remember where I didn’t want to get out of bed and face the day. The outpouring of love and kindness I received was beyond what I could have ever imagined. I learned again that the energy of love, prayer, and kindness travels unseen from the hearts of those who send it directly into the hearts of those who are ready to receive these blessings. My heart was fully open and receptive and I am blessed beyond measure. My well of gratitude knows no bounds. Here are some of the things I was reminded of and I hope they will, in turn, serve you. First, it was essential to take the day off for my mental, emotional, physical, and spiritual well-being. Mental — I gave my mind a mental break by choosing not to engage in the dozens of projects I have on the go. When thoughts of ‘must do’ came up, I consciously replaced them with ‘not now. I will come back, I promise.’ Acknowledging that I will return to those tasks allowed my critical mind to feel reassured and to soften. I gave that part of me (my ego) an official break as well. It didn’t need to stand on guard endlessly reminding me that this and that are awaiting my attention. Emotional — My heart was heaving with grief and sorrow. The sudden passing of my dear friend, Joseph Martin, triggered anguish that has been sitting in my cells seemingly forever. I was feeling grief not only about those who have passed, but also about the dangers threatening our world today, from a man like Donald Trump who disrespects everything that upholds truth and justice and equality, to the state of our beloved Mother Earth, the air, waters, the animal kingdom, our plants, our inhumanity towards one another, wars that don’t end. I found myself ruminating on the lyrics to Where Have All the Flowers Gone? My heart felt like it was being split open as I recited the Ho-‘opono’pono prayer, I’m sorry. Please forgive me. I love you. Thank you. I also let the tears fall freely as different people appeared sporadically throughout the day on the screen of my mind. Some have left the earth plane, some have left because of disputes, family members who I thought would be the closest have been the furthest away, and others have left and never told me why. The last two were the catalyst for my deepest sense of heartbreak, triggering memories of abandonment from my earliest days. As each memory arose, or even when it was simply a felt sense with no memory attached, I offered up what I, myself, was asking for—unconditional love. I also wrote a letter of apology to someone whose heart I hurt last week through hurried, unconscious behaviour. I asked Joseph’s spirit before I went to sleep the night before to write the letter for me. I know he would have done so with a full and open heart. I listened and the words spilled onto the pages of my journal which I transcribed verbatim into an email which evoked a heart-felt response in return. My day and night ran the gambit of love and fear. Of aloneness and yearning, intermingled with acceptance, gratitude, and long sought out peace. Physical — I allowed my body to rest. To meditate. To sleep. To eat comfort food. To listen to soothing music. To walk to the beach in the early evening without my phone. I felt blissfully at peace as I sat upon the rocks allowing the ocean winds and waves to cleanse and heal the melancholy that inhabited my body and mind. I had an instinct to take my gaze away from the mesmerizing sway of the waves and look up. Directly above me was an eagle swooping unusually close. I felt like he was waiting for me to notice him and when I did, he soared and circled above me for a very long time. I was captivated by this gift, this miracle, this totem of freedom that came into my life at this exact moment. I laughed out loud and gleefully shouted out, ‘Thank You. Thank You! Namaste! Thank You’. Then, I practically skipped home, stopping only once along the way to buy epsom salts to add to my long, luxurious bath of lavender. I settled for popcorn and a movie instead. Go figure! Then, just before turning out the light, I read another chapter, from Wayne Dyer’s book, I Can See Clearly Now. The book I have been savouring since he died. Spiritual — Every breath, every thought, word, and action is spiritual, is it not? How can it not be since the omnipotent and omniscient presence of Love is always here? God is present in the pain and the glory. I knew I was being held in the arms a divine presence while I cried out my tears, just as I knew God’s hand was at play when the eagle soared above me, inviting me to hop on his wings of freedom. In fact, a part of me has always known I am never alone and never have been. A perceived sense of separation is part of human existential yearning to go back to the garden. I have felt since I was a young child that the earth was not my real home. But I also know now what a privilege it is to dance on top of the earth and there’s no place I’d rather be. In summary, I can say that I am happy I was able to reach out on Facebook and tell my truth. It took a lot of courage, I must say, to have reached out publicly in that way. I also believe even if I hadn’t reached out, reaching inside, asking God (or whatever name you wish to give that which gave us Life) for guidance, or calling a friend, or reaching for that one book that is a touchstone to our spirit—that can be the salve we need to heal our melancholy. There so many ways to look after ourselves. And it’s essential that we do. Please see the writing exercise at the bottom of the page and tell us what yours are. I am reminded that feelings come and go. That nothing stays the same. And that I need not be alarmed when they come up in wells and swells so deep and I wonder, ‘how can this be? Haven’t I dealt with this many times before? ’ And the answer is, ‘Yes, I have’. And this is simply another layer and it doesn’t take days, weeks, or months to process. It moves through so much faster when I just honour what is and let go. How well did you love, how well did you live, how well did you learn to let go? I have a tapestry hanging in my hallway. Embroidered upon it are these words, ‘In the end, what matters most is, how well did you love, how well did you live, how well did you learn to let go?’ On Wednesday, I did it all. I just need to remember to repeat it on Thursday, Friday, Saturday, and every day, to the best of my ability. One precious day at a time. Thank you for sharing in my journey. May you have the most awesome day and for all the days and nights that follow, may you be blessed. Love, Junie. Most of the time it’s better to let people say things in their own words rather than trying to paraphrase and explain. Please watch these videos to learn about the profound transformations that completely liberated these people as a result of participating in my Re-Write Your Life signature program. You will hear Jan Falkowski share his riveting story of how he went from blind rage to being able to fully forgive the man who caused the car accident where his daughter was killed. Next watch Annie Lavack as she talks about her fears and insecurities of not knowing what she wanted to do in her life. 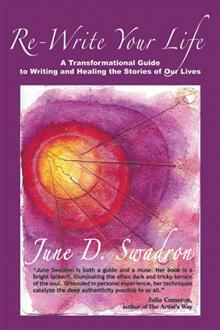 She states that it was the processes that she learned in Re-Write Your Life that enabled her to reclaim her voice. Today she is the Minister of the Centre for Inspired Living in Victoria. The next video that Shaw TV filmed some years ago will show you what happens in a real group setting. The program hasn’t changed, nor have the results. What has changed are the people who have made the commitment to go forward with their life in this way. After watching the videos, take some time, then ask inside whether you too are ready to re-write the painful storms of the past and make peace with them. Every story, no matter how painful, can become the elixir of healing, transformation, and ultimately joy! Early Bird Price extended to Monday, May 23rd! Write a list, or better still, draw a mind map, about the different ways you do or can take care of yourself when you are feeling sad, lonely, loss, grief, or despair. Then write about a time you did take action using one or more of these tools and what the outcome was. I just wrote about mine. Your turn! As always, please leave your comments below or join us at Junie’s Writing Sanctuary to contribute to the conversation.